The first music app, free and simple to connect Indonesian people to their local artists. Tuned Global, an Australian music mobile engagement company with offices in Jakarta, partners with some of the biggest independent music labels in Indonesia, Aquarius Musikindo, Musica Studio’s, MyMusic, Nagaswara, Trinity and VMC, to launch Nada Kita, the first completely free music app in that market. Firstly, Nada Kita is 100% free legal music. The music app gives users unlimited free access to the sounds of their favorite local music artists without consuming a lot of mobile data. “Tuned Global and the Labels have listened to the concerns of Indonesian people regarding music streaming, to design a music app that is fast and attractive for users,” said Con Raso, Managing Director, Tuned Global. Nada Kita is relevant and simple to use, offering a variety of stations pre-curated by local music editors, because most people are not music experts and are time poor. The user doesn’t have to create a playlist, they just pick a station and play. “Musik, Ga Pake Ribet” (Hassle free music) is the tagline of Nada Kita. "All we want is that Nada Kita becomes the soundtrack of your life and supports local music", explains Andreas Wullur, Managing Director of the VMC. The CEO of Nagaswara, Mr. Rahayu Kertawiguna has expressed a similar point of view "Nada Kita is innovative for the Indonesian market. It facilitates access to music lovers’ favorite songs, easily and legally, and for free of course. Absolutely every Indonesian can use it!". But free doesn’t mean that the music app won’t generate revenue – it would be detrimental to the musicians and Labels who take part in the application. First Nada Kita helps to fight against the piracy of artists’ content. Also the musicians and labels get a share of the royalties which are fair and open, this is via advertising and sponsorship. 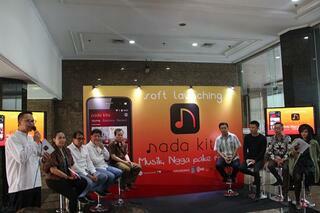 For its launch, Nada Kita is partnering with SPC Mobile, an Indonesian mobile phone manufacturer. "Nada Kita positioning is in line with the vision of SPC Mobile to strengthen local content in Indonesia. We believe that the Nada Kita music app will drive a great demand from Indonesian consumers, especially SPC Mobile users "explains Raymond Tedjokusumo, Chief Operating Officer of SPC Mobile. The Nada Kita first release is already pre-loaded in all new SPC Mobile smartphones and can also be downloaded on Google Play and the Apple App Store, if you are in Indonesia. New features will be added in the next few weeks along with a rapidly expanding catalogue. SPC Mobile is a brand of mobile phone locally owned by PT Supertone, an electronics manufacturing industry pioneer with over 25 years of experience. Establishing strategic partnerships with superior manufacturing in China and Taiwan, SPC Mobile maximizes its potential as a local mobile phone manufacturer by emphasizing on quality and after-sales service to make its customer satisfaction a priority. SPC Mobile has already a broad distribution network from Sumatra to Papua, allowing its products to meet the needs of communication in accordance with the needs of Indonesian society. For more information on SPC Mobile, please see: www.spc-mobile.com.